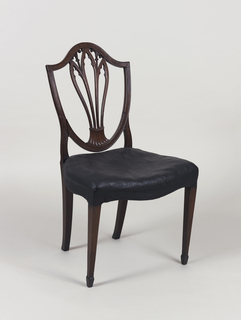 Shield back side chair with a splat composed of three open blade-forms; cusped on their interiors and separated under the top rail by two blossoms. The forms merge into a fluted spreading panel at their base. Its legs are straight, square, and tapered in the front on square feet. The seat is shaped, hollowed, and upholstered in black-painted canvas (possibly the original upholstery).